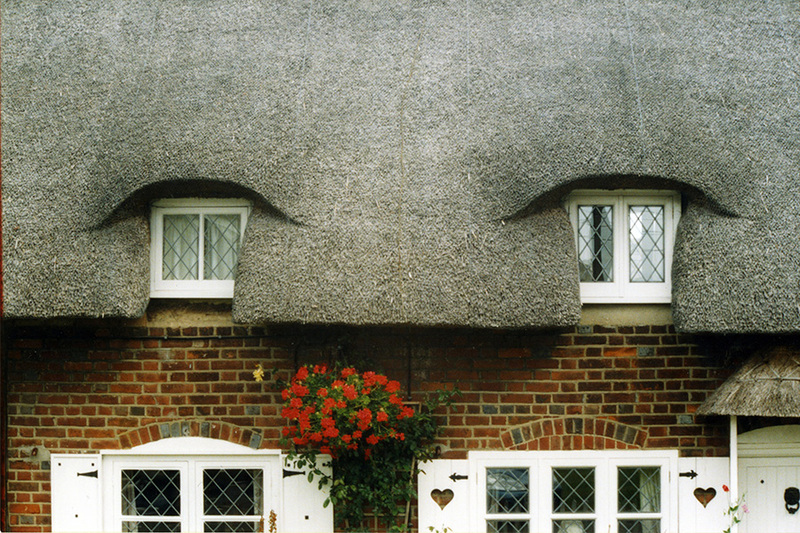 Two types… Small eyebrows on the left; and a set of dormers on the right. The dormers have been added, when this former, single storey Tudor house, was altered to make use of the attic space. Being a listed property meant the windows were placed in the rear elevation. 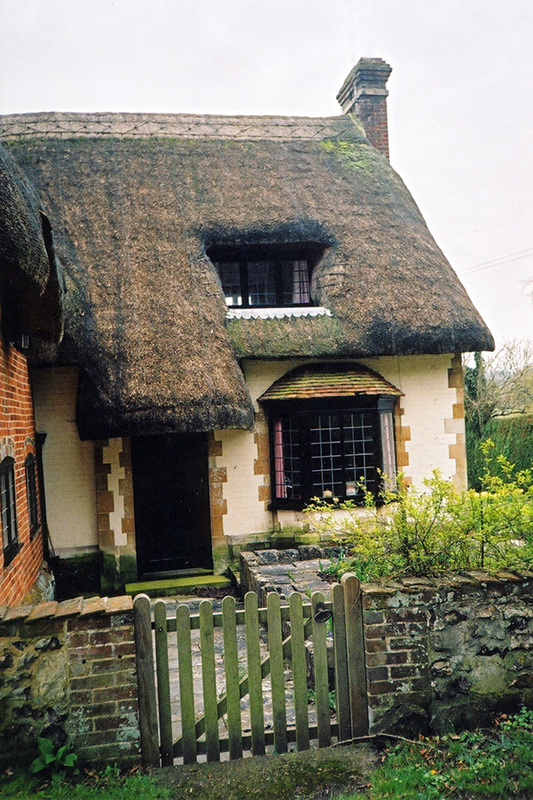 Left thatch; at Longfield in Kent. 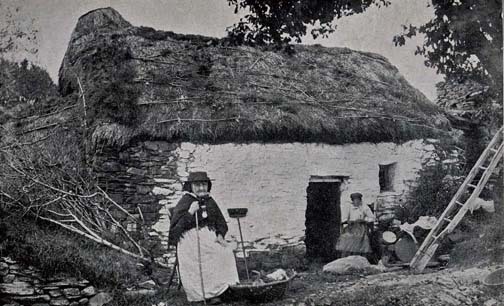 Right thatch; at Coel-y-Foel in Denbighshire. There are an enormous variety of windows, in both shape and size. 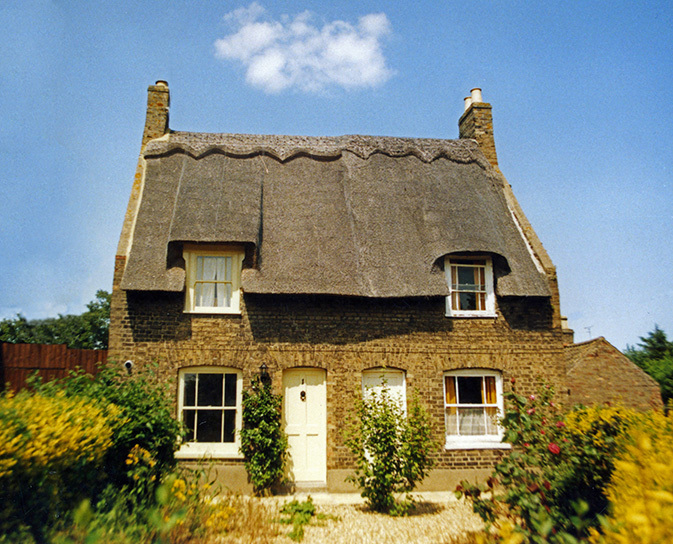 With all of these, the thatcher must allow for the fact, that the distance from the top of the window to the ridge; is always shorter than that from the bottom of the window to the ridge… This means that the thatcher, has not only to shape the work around the window; but also lose some courses of coatwork, on the top and often the sides of the window, into the bargain. Just how many courses need to be lost, can be roughly estimated; before the window is coated. The length of roof, from the top of the window to the ridge, is subtracted from the main roof length. (i.e. from the bottom of the window to the ridge. ) If this is then divided, to allow for courses of say around 12 in. (300mm) apart. A guide will then be provided for the thatcher. Shapes… There are several ways of shaping window eaves , apart from strictly following the line of the window…. Some would argue that a pair of cottages, should enjoy the same eaves treatment; some tend to disagree. 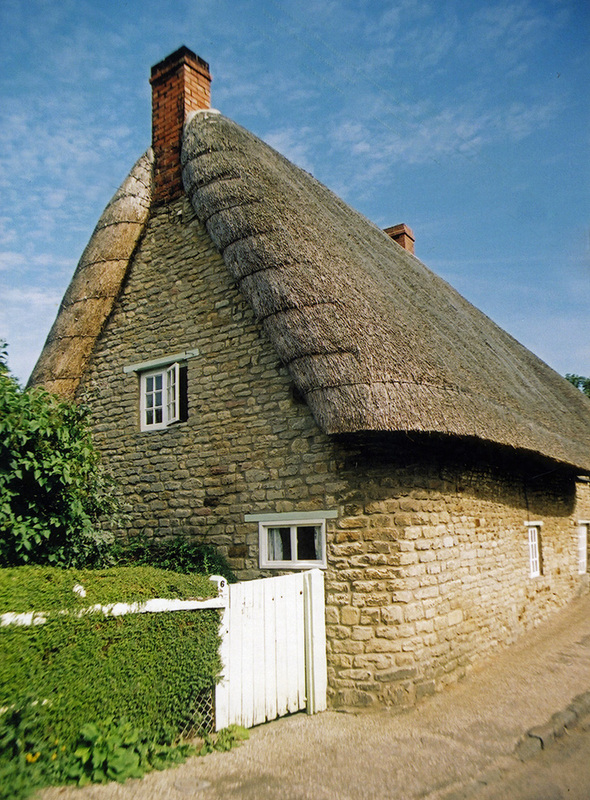 Thatching this type of window is fairly straightforward. Being a case of reducing the thickness of various courses and carefully shaping the roof. Whatever the height or shape of the window, the eaves and the brow course are always brought over the window, at their full thickness. If the thatcher has calculated, that say two courses need to be lost, then four main courses are often reduced to half thickness, as they are brought over the window. Being increased to full size once more, when the other side of the window is reached. Once this is done, all the subsequent courses are brought, full sized, over the window; following the line of the roof. Gradually levelling out, into the pitch of the main thatch, as the top of the roof is approached. The top of the window is not only shorter than the main roof, but also flatter; hopefully not too flat… (The minimum roof pitch, of 45 degrees, should always be borne in mind; by anyone contemplating a new window.) Creating enough springing here is not a problem. In fact care must be taken, to see that enough backfilling is used, to keep the thatch in the coatwork, as steep as possible. Large and small… Whether the windows only just protrude into the roof, or are a major feature; the same working methods apply. The thatcher simply loses more courses of coatwork, as the window height increases. The roof on the right needed considerable skill, to fit in such high windows, so close to turning gables… Left thatch, at St Nicholas in Glamorgan. 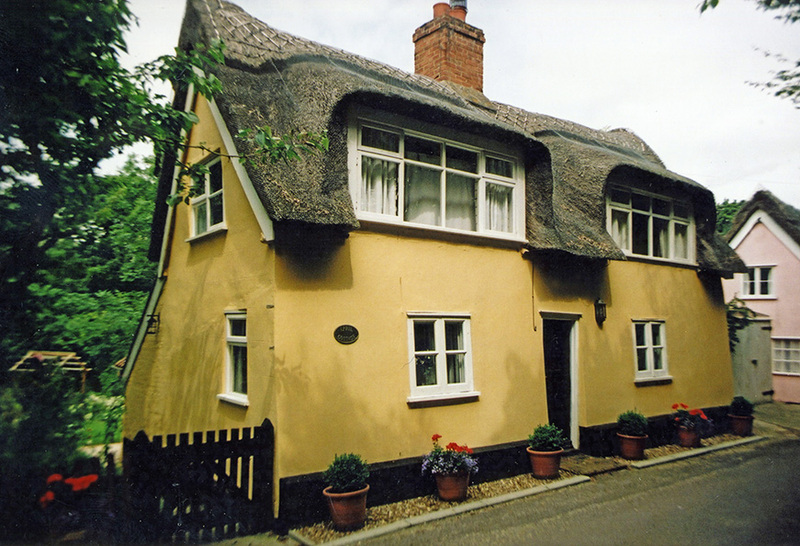 Right thatch, at Sternfield in Suffolk. When creating a new dormer window, allowance has be made for the thickness of the thatch coatwork… A gap of at least 18 inches (450mm) must be left, from the bottom of the dormer down to the main roof level. This allows a full thickness of coatwork and a ridge, to sit under the window. The first part of this feature, the thatcher should attend to is the easiest, being the area below the window. 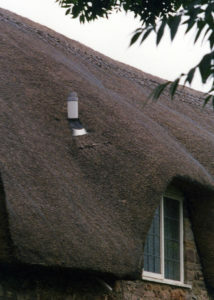 Depending on the amount of space under the window; an eaves, brow, and a sufficient number of full courses, are thatched as normal. The thatcher should cease coating, once the top edge of the coatwork, is the correct distance from the bottom of the window; to allow for the desired width of ridge to be fixed. This ridging is usually done after the coating, along with the main ridge. Filling the gap… In around 1930. This dormer can now be treated as an eyebrow window. The lower section having been thatched in. It seems this new roof, was not designed by any in the craft… As the next dormer, on the left, sits a little too close to a valley. And is only just thatchable. In a quite corner of Middlesex… A very long pair of dormer windows, in a hip end. But this is just thatchable, as the windows lie in the straightwork, at the bottom of the turning hip. And just enough room is left, on either side of the dormers, to turn out of the feature. 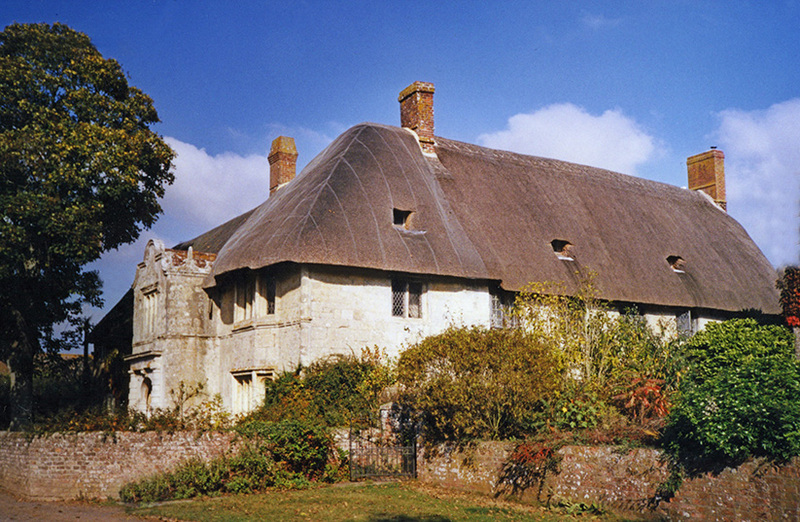 Sinking back… On multilayered roofs, the dormers often seem to retreat into the thatch, as the thickness of the roof increases over the years. The shape of the window fades away; and a wider lead apron is often needed. But these soft shaped windows can look very attractive. A single ‘sinking’ dormer, on the right, at Wherwell in Hampshire. And a row of tiny attic windows at Hamoon in Dorset. Chimneys, Lums and Vents… Letting the fumes out. In the past, the comfort a fire could give came at a price. The smoke from the hearth, in both palace and hovel, had to find its own way out of the building. Taking a long sooty while to make the journey… Many thatched roofs still bear the black marks; on timbers and thatch; of this lazy progress. Giving mute evidence, to life before the chimney. But when countless thatched roofs had chimneys inserted, some new problems had to be solved by the thatcher… Much later, the fumes from modern indoor sanitation, also needed venting; giving the thatcher yet another feature to complete. 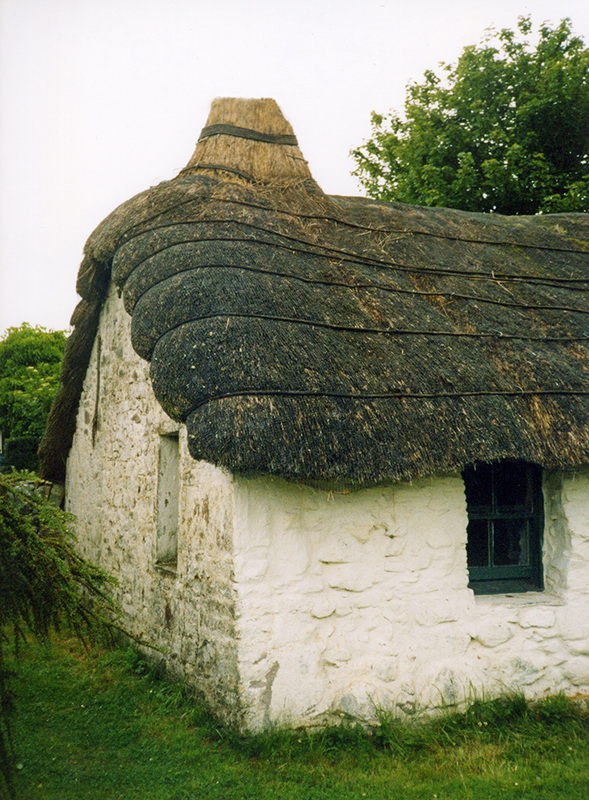 Often a headless barrel or timber box was fixed into the apex of the thatch. These are known as Lums in Scotland. Where the roof was roped into place, the lum was thatched and roped into position as well. This type of opening was commented on, by one Bishop Hall, in 1610. He wasn’t that impressed, as the cottage interior he saw, still had: ‘thatched sparres… furr’d with sluttish soot… a whole inch thick’. Where the householder could afford it, a stack of stone or brick was erected. 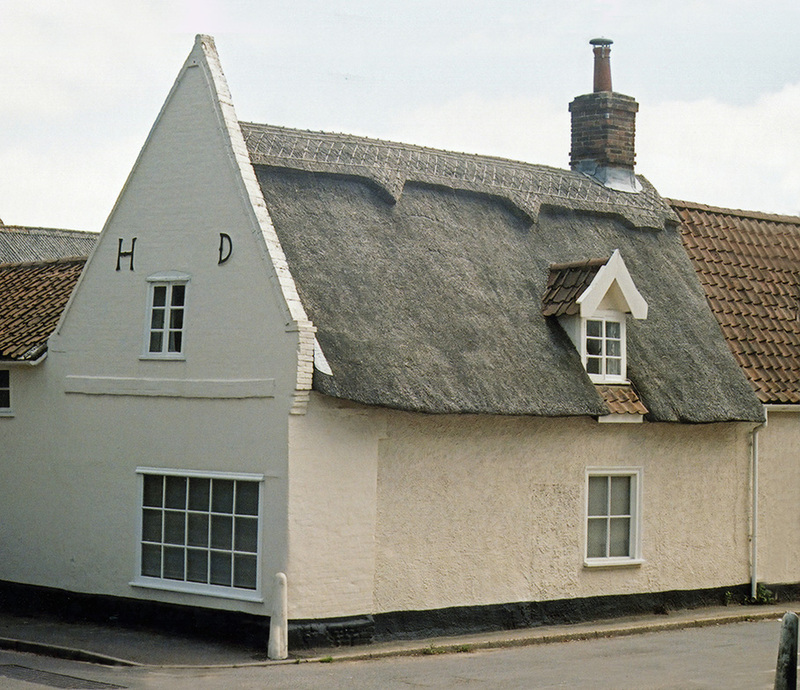 The 1621 by laws, of Clare in Suffolk; forbade anything less than four and half feet (1.35m); above the thatch. (Today’s regulations require two metres. Although most old chimneys fail to meet this height; without any serious problems.) The cheaper option, was to construct a chimney from wattle and daub. This type was banned in London, in 1419. But many cottages had such a chimney, well into the nineteenth century. 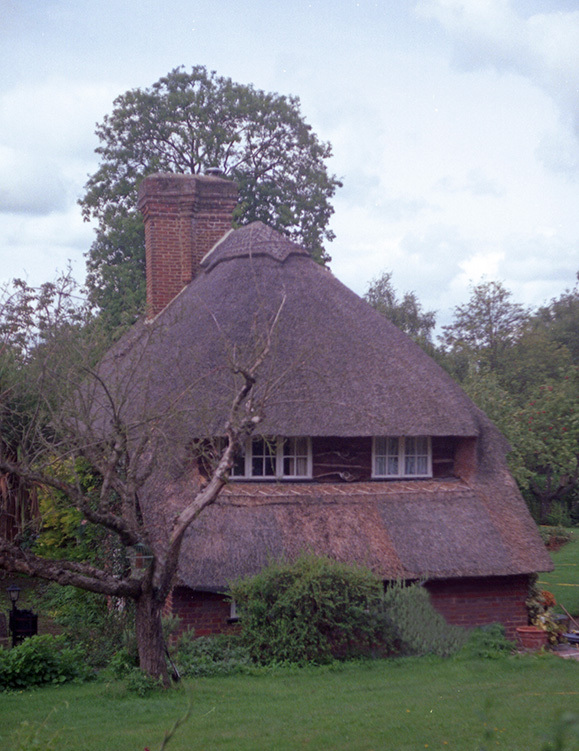 Chimneys occur in various parts of a thatch roof; in the ridge, at a gable end and at the eaves. 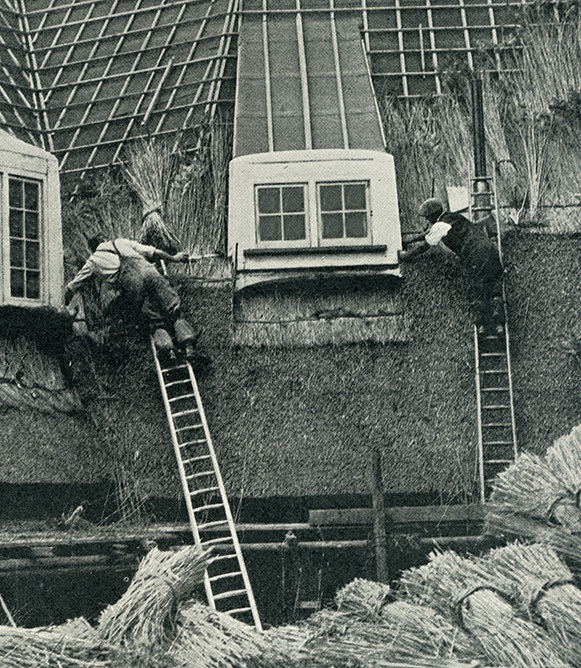 Each position needing a different thatching technique, to make a waterproof join. 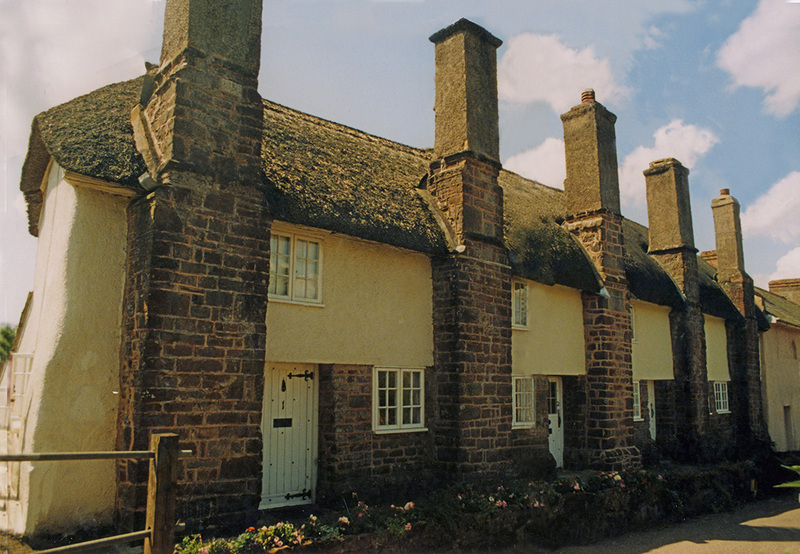 Devon chimneys… The left hand roof, seems to have more chimney than thatch… These four hundred year old almshouses, have an abundance of eaves chimneys; that are very common, in this part of Britain. The right hand roof is fully coated , and waiting for a ridge. Showing how high up the thatcher can coat, under the central ridge chimney… The left end of this roof has a new gable end chimney; a turning feature, which the turning gables can wrap around easily enough. Left thatch; at Cheriton Fitzpaine. 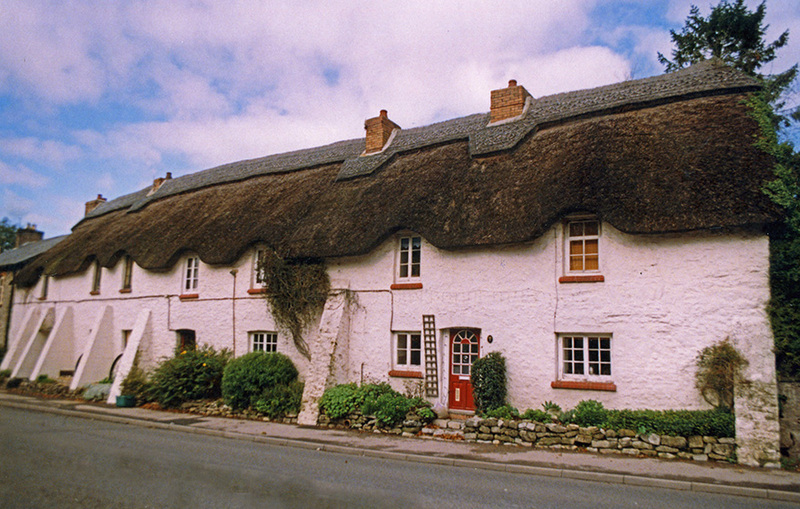 Right thatch; at Chumleigh. 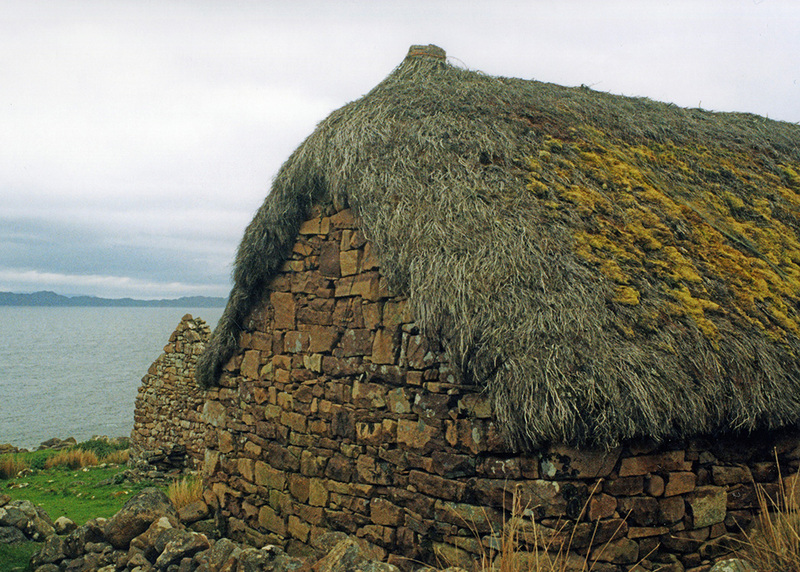 The modern equivalent of the lum, a chimney in the ridge is the most common type, and the easiest to thatch around. As long as it is surrounded by straightwork. These are found where the fireplace is situated along the central line of a building. Any potential problems will occur, when the ridging is completed under these chimneys… Ridging consists mainly of knuckling up, the chosen material tight against the chimney. But wooden spars, used to fix the ridge, don’t drive into solid brickwork very well! Thus skill is needed here, to ensure that all the ridge spars are driven very much uphill; and slant away from the masonry. Rainwater just loves to track down a spar, and then down the chimney! 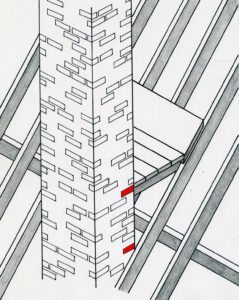 Mortar fillets or lead flashing then cover the join, between any ridging and the chimney, it is good practice the allow an ample coverage, of mortar or lead below any chimney; as this receives all the extra rain created by these features… Something in the region of 6 inches (150mm) or more, in width, being necessary. The other, more common method, is to have a lead gutter behind the chimney. This is basically a wooden shelf, covered with lead sheeting, designed to direct the water; away from the rear and down the sides of the chimney. The thatcher coats both sides of the chimney; until the top edge of the coatwork face, is in line with the back edge of the chimney. This should now be at the same level as the gutter base. A lead gutter should now be dressed over the thatch and the base. The gutter needs to extend a little way up the chimney and more importantly some way up the roof… And should be wider than the chimney by at least 4 inches (100mm) on either side. Lead flashings, of the same width, can now be fixed down the sides of the chimney, to the eaves. 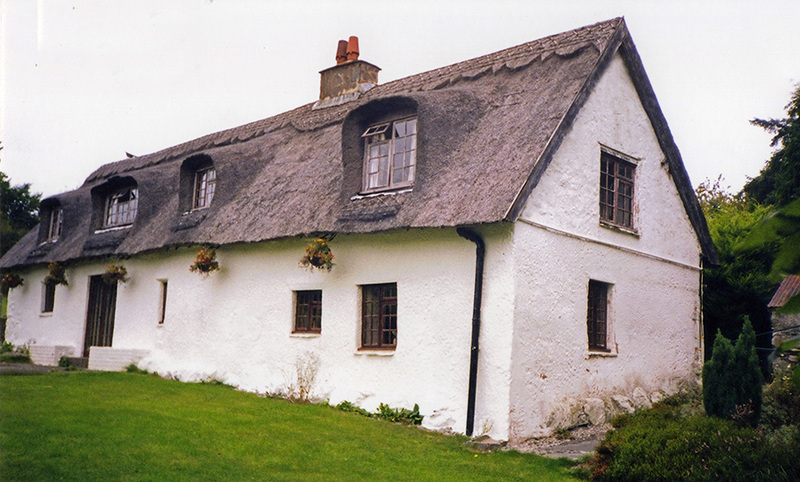 The thatching can now continue, over the lead gutter… The roof in effect, is restarted behind the chimney. With an eaves and brow course, followed by the other main courses. A gap is left, between the thatch and chimney, to allow any for any debris, fallen leaves etc. to be cleared away easily from the gutter. Vent Pipes… Keeping cottages sweet. As with an eaves chimney, the main danger is water running down behind the pipe. This problem is solved, by fixing a collar around the pipe and thatching over it. When thatching in a new vent pipe it should, initially, not be fixed into position; as some movement up or down may be needed. The finished job will also look much tidier, if care is taken to place the pipe vertically in the thatch. A necessary evil…Any vent pipe should be as unobtrusive as possible. Rolled, Masonry and Boarded Gables… Giving a straight edge. The big advantage of the turned gable is that by overhanging the wall, it sheds water well away from the building. But this overhang in turn, has the disadvantage of being prone to wind damage; in an exposed situation… This is why boarded and masonry gable ends, are traditionally found in the northern, more windy half of Britain. A local supply of good building stone or brick, is needed for a masonry end; often known as a Watertable. Thus these are often seen along the Jurassic limestone belt, that runs from Dorset to the River Tees… Brick is more common in Norfolk, Lincolnshire and Lancashire. Rolled Gables… on the right. A heather thatch, at Lonbain in Wester Ross. 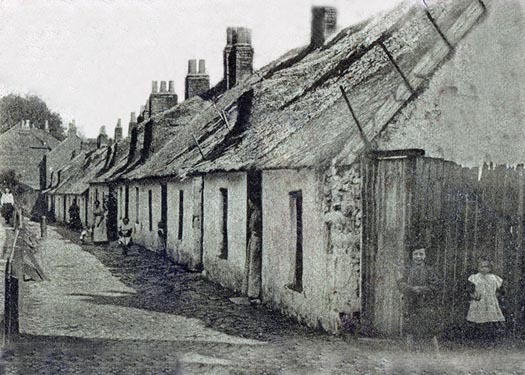 With gables wrapped and wired into the wall; to keep the Atlantic storms at bay… Rolled to perfection, on the left. 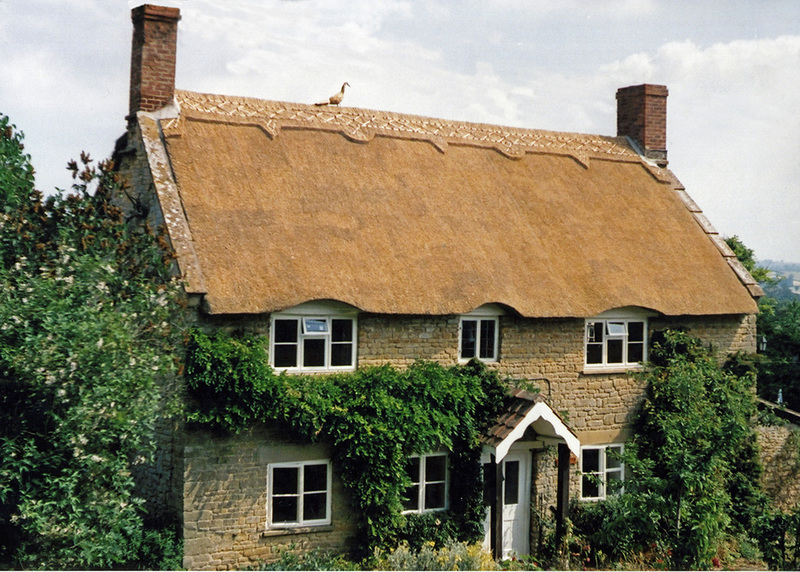 A multilayered roof in long straw; at Tichmarsh in Northamptonshire. Masonry Gables… A high brick end at Shipdam, in Norfolk. A relic, from when this roof was covered with a thick, multilayered long straw thatch. 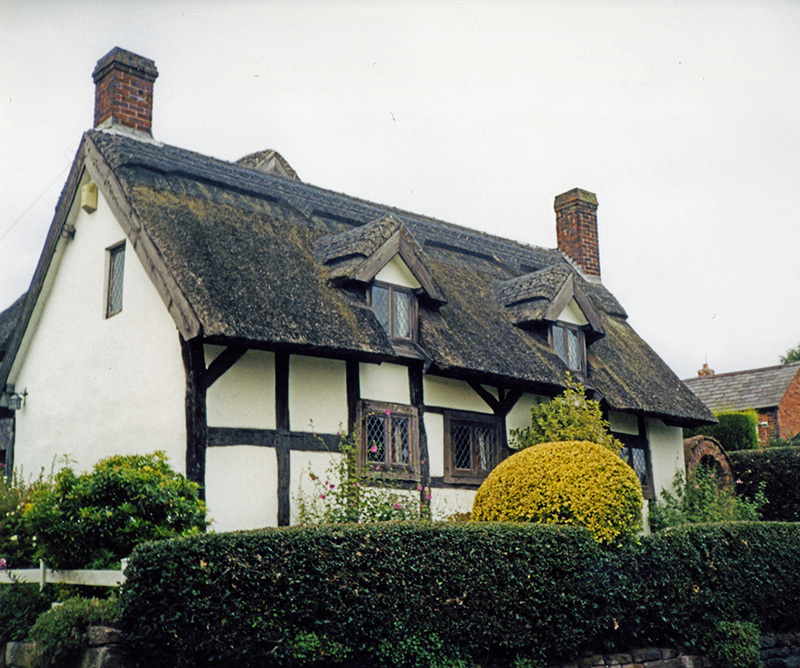 Turned gables are more difficult to thatch, on the edges of thick multilayered roofs. Here the rolled gable holds sway. 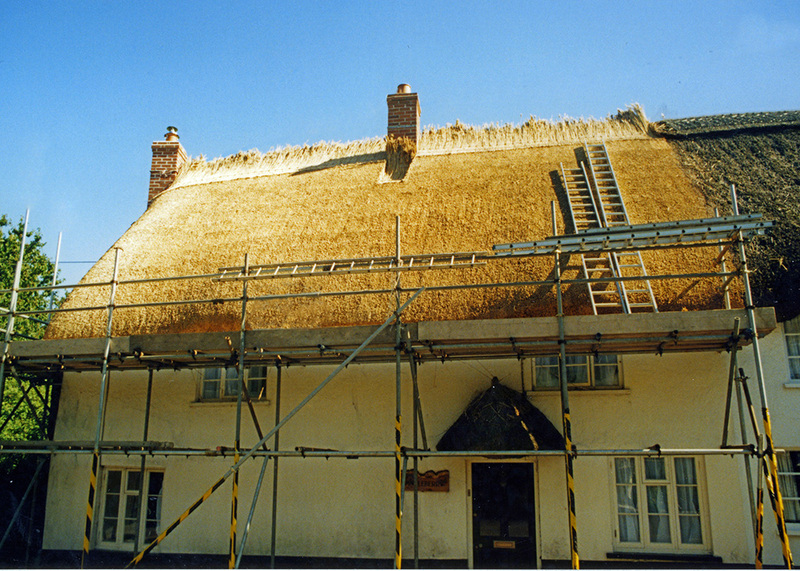 To achieve this often attractive feature, the thatcher uses spars and liggers to hold the edge of the roof in place. Usually adding a little more material into the end, to cover and protect the underlying fixings… The decorative sparwork used here, will need repair on the same time cycle as the ridge.